Success eluded Celtics guard Ray Allen 13 times over Tuesday night. One game after setting an NBA Finals record with eight three-pointers, Celtics Allen narrowly missed tying the Finals record for most shots taken without a made basket, going 0 for 13 as the Celtics fell to the Lakers 91-84 in Game 3 of the NBA Finals. The Lakers lead the best-of-seven series, 2-1. Allen tried and tried again, but his 13th and final miss was the most crucial. With 54 seconds left and the Celtics down 84-80, Celtics coach Doc Rivers drew up a play for Allen. Allen sprinted to the corner and had a good look at a three-pointer, but the ball clanged off the back of the rim. With Allen’s night officially a shutout, the Lakers converted on their next possession and shut the door on Game 3. It didn’t look as if the Celtics were going to be shut out early on. Kevin Garnett scored the first six points of the game for the Celtics in the paint, shaking Pau Gasol on Boston’s first offensive possession. 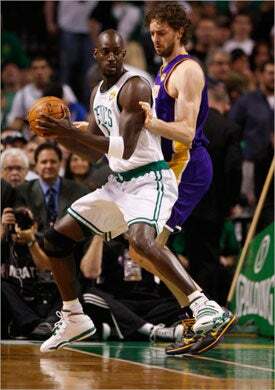 But while it looked like Garnett had shaken off the cobwebs, the Celtics had trouble shaking off theirs. Los Angeles ended the quarter on a 21-5 run. Allen and Paul Pierce went a combined 0 of 10 in the period. The second quarter wasn’t much better for the Celtics. The Lakers increased their lead by just three points at halftime, but gone was the free-flowing basketball that had Rajon Rondo running and the Garden rocking during the first four minutes of the game. If the game seemed like it bogged down in the second, it did — the teams combined for 25 fouls in the first half as the Celtics trailed 52-40 at the break. The officials seemed to let both teams play to start the second half, the grind-it-out style of basketball favoring the Celtics. The Celtics cut the lead in half in the third, whittling the deficit down to six thanks to some quality minutes from Tony Allen (6 points in the third). Allen’s play allowed the Celtics to get closer despite dismal play from Ray Allen (0 for 11) and Pierce (four fouls) through three quarters. The Celtics started the fourth quarter on a 6-1 run, a layup from Rondo cutting the deficit to 68-67 with 9:46 remaining in the game. But the Celtics would get no closer than that one point deficit, preventing the fans at TD Garden — who were getting their first taste of Finals basketball — from getting that full, positive release they were seeking. An unlikely hero emerged for the Lakers in a grind-out game, as Derek Fisher exposed a weak spot on the left side of the Celtics’ defense on his way to 11 points in the fourth quarter. Fisher’s dagger came after Allen’s 13th and final miss, the Lakers point guard driving the ball the other way after the miss and hitting a floater off the glass while also getting fouled. The free throw put the Lakers up seven points without enough time on the clock for the Celtics to make a comeback. The Celtics were noticeably devoid of playmakers Tuesday night, with Allen struggling and Pierce (15 points) limited by foul trouble. Kevin Garnett’s playoff-best 25 points were almost lost in the play of the other Two. Allen’s 13 misses without a make was one short of the record shared by Chick Beiser and Dennis Johnson (when Johnson played for Seattle). Final, Lakers 91-84:That’s it. The Lakers take Game 3 and lead the series, 2-1. 48.3 4th quarter, Lakers 87-80:Ray Allen misses his 13th shot in 13 attempts and Derek Fisher drives the other way for a layup and a foul. Fisher has 11 points in the fourth. 1:29 4th quarter, Lakers 84-80:The Lakers double-team Garnett (25 points), forcing Doc Rivers to call timeout after the Lakers knocked the ball away from KG. During the timeout, officials looked at the replay and gave the ball to Los Angeles. 2:17 4th quarter, Lakers 82-78:Pau Gasol makes offense look so easy sometimes. Gasol’s turnaround over Glen Davis puts the Lakers back up four. 3:11 4th quarter, Lakers 80-76:Derek Fisher has come up with eight huge points in the fourth quarter. Ray Allen is now 0 for 12 for the game. 5:40 4th quarter, Lakers 74-70:The Celtics have gotten no closer than one point here in the fourth quarter. Pierce and Allen still haven’t gotten on track for the Celtics, and they’re running out of time. 9:45 4th quarter, Lakers 68-67: The Celtics are almost all the way back, a driving layup from Rondo cutting the deficit to one. A low-scoring game like this one favors the Celtics big time. 11:21 4th quarter, Lakers 67-63: Pierce picks up his fifth personal foul and heads to the bench. Big call on Pierce even though he’s not playing well because it means Ray Allen, who’s really not playing well, has to come in. End 3d quarter, Lakers 67-61: The Celtics cut the Lakers lead in half in the third quarter thanks to some big minutes from Tony Allen. Allen played eight minutes in the third, guarding Kobe Bryant and finishing off three big plays around the basket on the other end. Allen’s energy seemed like the first infusion of energy the Celtics have had since very early in the game. Ray Allen is 0 for 11. If he or Pierce can somehow get on track, the Celtics will win this game. 4:45 3d quarter, Lakers 58-49: Andrew Bynum limps off the court after a great sequence in which he challenged two Kendrick Perkins shots successfully. Looks to be more of the same knee caution/rest for Bynum. 6:09 3d quarter, Lakers 58-49: A nine-point deficit feels like about 50. Just looking over the stat sheet again and the Celtics made 8 of 17 shots in the second quarter. Not bad at all, and yet it felt as if the Celtics had no flow. Kevin Garnett (19 points, 8 of 12) is having a dominant game, but he’s getting no help. 9:05 3d quarter, Lakers 54-47: Paul Pierce hits a three-pointer and Ray Allen knocks down two free throws to get the Celtics to within seven. Halftime, Lakers 52-40: It’s been ugly for the Celtics since they led 12-5 with 7:41 left in the first quarter. The Lakers only increased their lead by three points in the second, but this game is devoid of flow — 25 fouls combined between the teams so far. Gone is that free-flowing basketball that had Rajon Rondo running and the Garden rocking during the first four minutes of the game. 2:30 2d quarter, Lakers 43-34: Paul Pierce picks up his third personal foul, though he did just make his first three-pointer of the game. He’s 1 of 7. 5:55 2d quarter, Lakers 37-26: Not that we buy into these kinds of things, but the Celtics have been called for 10 personal fouls, the Lakers five. 7:14 2d quarter, Lakers 37-24: Nate Robinson is in to spell Rajon Rondo. Robinson has made two shots, but he got away from the offense on the last possession, dribbling out the clock before throwing up a bad three-pointer. The Celtics are out of sync in almost every way. Thank goodness the Lakers are just 1 of 7 from the three-point line. 10:41 2d quarter, Lakers 31-17: A quick 5-0 run by the Lakers forces Doc Rivers to call timeout. END 1st quarter, Lakers 26-17: The Lakers end the first quarter on a 21-5 run to take a nine-point lead after one. The Celtics started hot but struggled to 35-percent shooting for the quarter. Paul Pierce and Ray Allen are a combined 0 for 10. 2:59 1st quarter, Lakers 18-16: Entertaining start so far. The Lakers did a nice job absorbing that initial Celtics run and have quieted the fan frenzy for now. Kobe Bryant has five points but hasn’t dominated. Derek Fisher leads the Lakers in attempts with four, which is a problem. Bryant and Gasol need to shoot more. 5:55 1st quarter, Celtics 12-9: Kendrick Perkins picks up his second personal foul and goes to the bench. 7:41 1st quarter, Celtics 12-5: The Celtics are putting on a clinic of hustle, and of course the clinic is being directed by Rajon Rondo. Rondo has 6 point and 2 assists already. When he’s not finding his teammates, he’s cutting to open spots on the floor for easy lay ups. There are times when he plays the game at a higher speed than everyone else. Ron Artest picked up two quick fouls and has been replaced by Luke Walton. 10:43 1st quarter, Celtics 6-0: Kevin Garnett takes Pau Gasol to school on a pretty post move, then scores on an alley-oop and lob to put the Celtics up early. Garnett must be tired of people telling him he looks old. Pregame: “Beat LA” chants in the crowd. Fans are all in their seats. Ready to go.